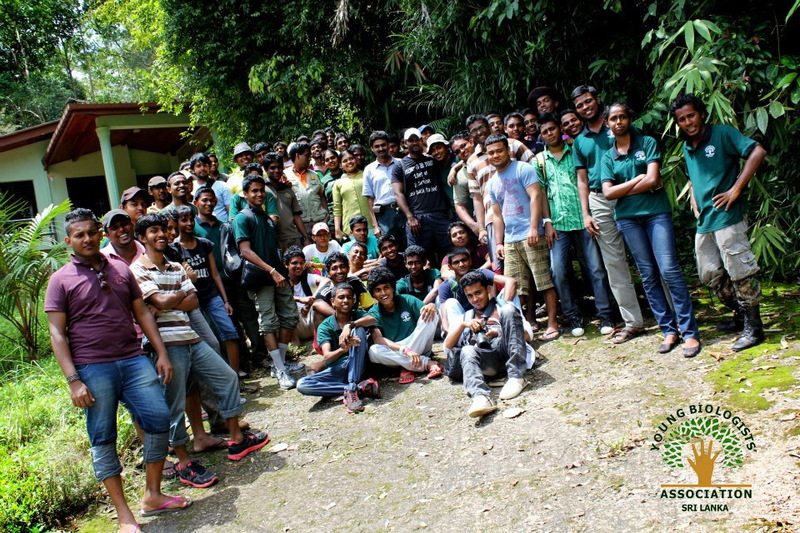 On 12th September 2012 the members of YBA went on the association's annual trip to Sinharaja forest. 82 members including new comers participated to the trip. We started our journey from Museum at 6.30 am. and members joined in from Nugegoda, Maharagama, Kottawa, Horana and Mathugama. The members enjoyed the time singing and having chats. After reaching Mathugama we had to wait there for some time until the lunch packets were prepared. It caused a little delay and it was around 12.30 when we reached our destination, Sinharaja. After having lunch and taking a group photograph the team went to the main entrance of the forest. Current YBA president Indeewara Jayalath and Patron Prof. Hiran Amarasekara gave a small introduction to Sinharaja forest and explained the new comers how to behave inside the forest. Then we divided in to 3 main groups which were led by senior members of the association and accompanied with a guide. Two of the teams went to the Mulawella peak using the two trails to reach there and the other team used the Giant Navada Tree trail. From the beginning of the trails we encountered many interesting animals and plants. At the very beginning we could observe several butterfly species including Blue Oakleaf, Red Helen (Papilio helena) , Blue Mormon (Papilio polymnestor), Tree Nymph (Idea iosonia) and Clipper. Later we found Ceylon Birdwing (Troides darisua), Plum Judy, Commander, Glad-eye Bush brown and many other butterflies. Among the Dragonflies encountered Wall's Grappletail (Heliogomphus walli), Sri Lanka Cascader (Zygonix iris) and Pale-faced Forestskimmer (Cratilla lineata) were some of the highlights. Our members observed some fish fauna at the famous "Maguru wala" where we found Combtails (Belontia signata) , Walking Cat fish (Clarias brachysoma), Stone Sucker (Garra ceylonensis) and Rasbora. During the trip we found several reptiles including the snakes Sri Lanka Wolf Snake (Cercaspis carinatus) which was observed while feeding on some eggs, Green Pit Viper (Trimerasurus trigonocephalus), Striped-tailed Bronzeback (Dendrelaphis caudolineulatus) and lizards such as the Kangaroo lizard (Otocryptis wiegmanni) and Green Garden lizard (Calotes calotes). Bronzed Frog Hylarana temporalis, Sharp-snouted Shrub Frog Pseudophilautus cuspis and Corrugated Water Frog Lankanectus corrugatus were among the amphibians we encountered. As we walk in the forest we came across hundreds of plant species. 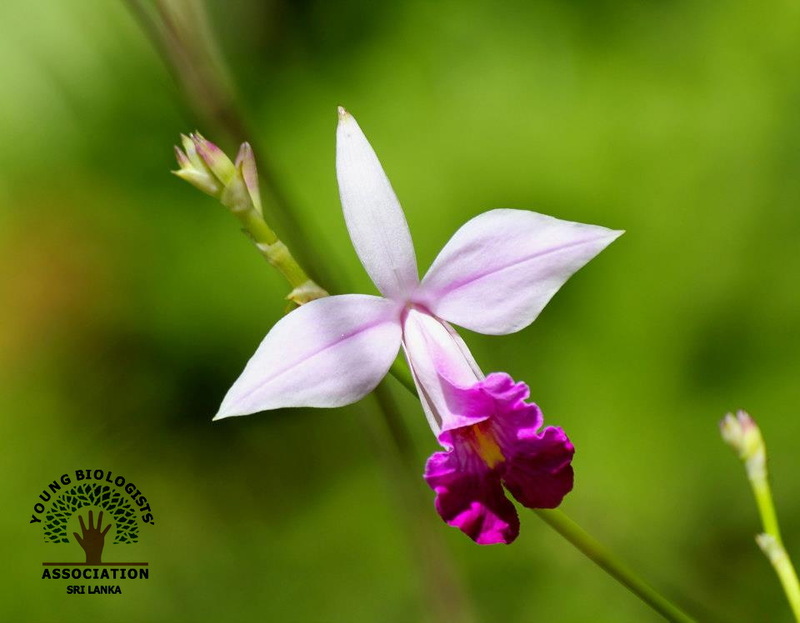 Some of the plants that took our special interest were the endemic pitcher plant or Bandura (Nepenthes distillatoria), Bamboo orchid, Bowitiya (Osbeckia spp.) Nelu (Strobilanthus spp.) Weniwal, Pus Wal (Entada phaseoloides) and several other plants with beautiful flowers. While observing all these the senior members of the association shared their knowledge and experiences with the new comers. Some of them were really interested in learning about the value of this unique biodiversity. The teams which climbed the Mulawella mountain had to hike in a rugged terrain and it was a little bit difficult for some of the members. However with the help of the friends everyone reached the peak at about 4.00 pm. 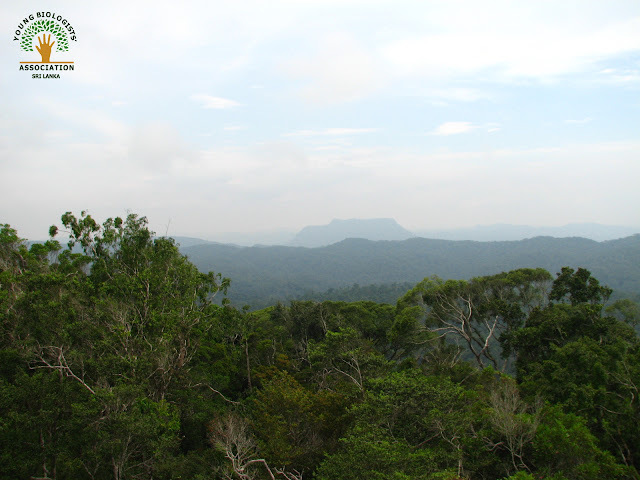 The peak which is 762 m above the mean sea level, provides a nice view of the surrounding forest and mountains. 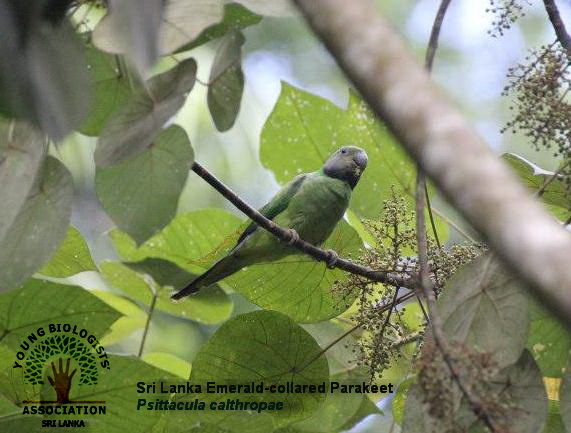 The team which followed the Navada Gaha trail also reached their destination, which is a giant tree of the species Shorea stipularis (Navada in Sinhala). It is 6.3 m in girth and 43 m in height. After spending some time at their destinations resting, enjoying the landscape and taking photographs the teams started their journey back to the entrance of the forest. During the time spent in the forest the members could observe many bird species including the endemics Sri Lanka Junglefowl (Gallus lafayettii), Sri Lanka Red-faced Malkoha (Phaenicophaeus pyrrhocephalus), Sri Lanka Magpie (Urocissa ornata), Sri Lanka Emerald-collared Parakeet (Psittacula calthropae), Sri Lanka Brown-capped Babbeler (Pellorneum fuscocapillum), Sri Lanka Orange-billed Babbler (Turdoides rufescens), Sri Lanka Scimitar Babbler (Pomatorhinus melanurus), Sri Lanka Grey Hornbill (Tockus gingalensis) and proposed endemic Sri Lanka Black-crested Bulbul (Pycnonotus melanicterus). 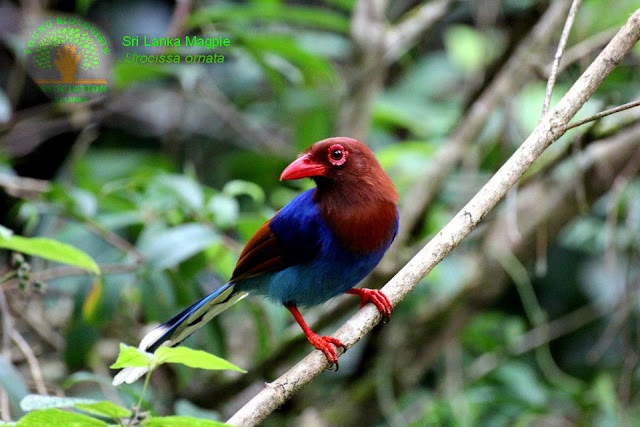 On the way back the calls of Sri Lanka Spot-winged Thrush (Zoothera spiloptera) and Frogmouth (Batrachostomus moniliger) were heard. The only mammals seen during the trip were Purple-faced Leaf Monkey (Semnopithecus vetulus) and Giant Squirrel (Ratufa macroura).